I took a bloggy break. Actually, I took a complete, out-and-out, computer-free, internet-free, blog-free, totally unplanned, completely out-of-the-blue, yet immensely satisfying VACAY-SHUN. Huh… I think I needed it. I feel refreshed. It’s nice to be back here. My hands have remained busy however. I continue with the hexagon quilt. Everyday, I add to it. I’ve been working on it for 49 days straight for a total of 750 hexies. 49 consecutive days!!! That’s a tiny miracle. The above photo shows only a third of what I’ve pieced together so far… WHAT?! You didn’t think I’d reveal the whole thing did ya?? Nuh-uh. No way Jose. I ain’t showing you the whole thing until I have the whole thing to show you… I’m sorry. But bits and pieces is all you’re getting until then… I know. I’m a very mean and cruel person. And you? How’ve you been? Did I miss anything good? Previous posts on this quilt: here and here. While I was away, I was featured in IspirAzioni Magazine! I love it!! Your hexagons are wonderful!! Can't wait to see more!! I'm taking a blog break too. I'm on holidays with Eric and the kids…so taking a time off!! It is beautiful. Thanks for the sneak peek! You have not missed much from me. I have taken a long, unplanned blog break as well. Definitely needed. I think all of blogland needs a nice refreshing vacay. We can all come back happy and full of inspiration and new ideas. 🙂 I'm planning on taking mine in a couple weeks when #5 hits the scene. Don't know how much relaxing I'll do, but we will have fun! Hooray for hexies! They are looking wonderful. We're almost finished with our house, and are hoping to move in next week, pending final inspections. You have inspired me to play with hexies again – but not nearly on this scale. Little dabbler size projects. I will take bits and piece3s – what ever you care to share!! My eye love seeing every one! 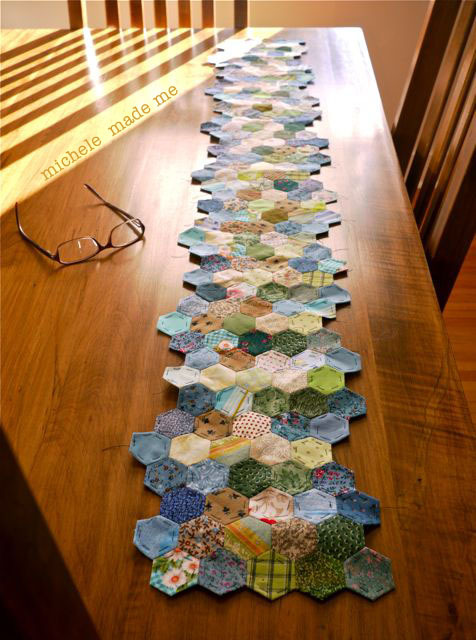 Your hexie quilt in progress is beautiful! I love the colors! Which has me wondering if the whole quilt will be the same colors, or if you are going to mix it up a bit. I can't wait to see the finished quilt. Congrats on 49 days of hexie making – that is impressive! You sound like me, "what's new? what's shakin'? what's happening?" Welcome back, hexy lady! Oh you are a tease Michele! I do love what you have shown us so far and doesn't it make a great table runner too. It is nice for the soul to have a break from things every now and then. I too have been having an unintentional blogging break but am back as of today. No problem. I like the suspense. Hooray for all your work and keeping up the hex project!!!! It's looking great. Yeah, vacation from the internet is a good thing. Glad you're refreshed. Welcome back. WOW Michele! the hexies look fabulous! Welcome back after your break!! Fabulous photo!! I took a mini-media free break this weekend – unintended but very nice! !